Unlike any regular slots that you have ever played, Cutie Fruits slots does not has any pay-lines and the common reel structure. 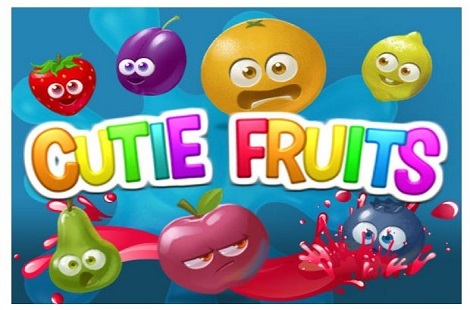 The Arcade style online video slot Cutie Fruits, from DaGaCube can bring you the juiciest of wins on its distinctive 5×5 grids. Here you can catch winning combinations by simply aligning 3 or more matching fruit symbols horizontally or vertically next to each other on the grids. You will have the possibility of levelling up while playing on this colourful game, and discover up to 25 levels over 5 different worlds. Symbols associated to the online video slot Cutie Fruits slots are Blueberries, Plums, Strawberries, Oranges, Lemons, Pears, and Apples. As you load this game, you will start on the Party Beach world where you will find a ship wreck on the shore of a beach as background. Stake value ranges from £0.60 to £9.00, and an Auto Play button will provide you the possibility of choosing up to 100 game rounds to play successively. When 3 or more matching fruit symbols make up a winning combo, these fruits will pop and this will make other fruit symbols fall into the empty spaces, thus giving you the possibility of grabbing multiple wins with more matching fruit symbols combos. There is an optional Gamble feature that is presented to you after any one or a set of winning combinations. Here you will be prompted to select one of two fruits, and selecting the right one will double your winnings. Higher levels can be reached by earning points while playing the game. A level up is achieved once the progress meter found on the top left hand side of the screen is filled. The Beach Party game World is the first of the 5 worlds spread over 24 levels found on Cutie Fruits Slots. Your progress is saved between games and it is automatically reset every three days. Once you have reached level 24, you will stay on this level until the game is reset. You can also complete bonus or letter patterns to earn up to 300 points on Cutie Fruits Slot. Powerups can randomly be earned on any spin with no win. Powerups such as Party Pineapple and Jonah Jellyfish can make their apparition randomly among other fruits and create the chance of grabbing big wins. Playing this exclusive DaGaCube Slot game on Bingo sites listed by Online Bingo Reviews.com, will be an enjoyable time with the cute-looking and tasty fruits!